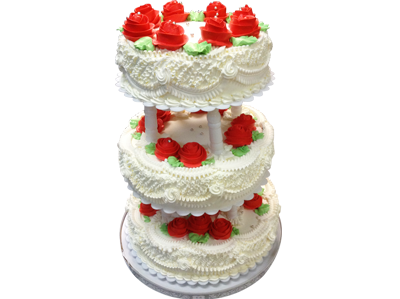 The wedding cake is customized, the variety of cake sizes and designs are offered. It could be done for 2 tiers, 3 tiers or more depending on your personal preference. The wedding cake is made by the sponge cakes and comes with two favours choices and finished with fresh cream decorations. The fresh flowers or roses could be requested, the additional fees would be applied. For any further details, please contact us by phone or visit us directly.